Comments allow users to engage with the content on your website. That’s why we believe that it is important to style your comments layout and comment form, so it is user-friendly as well as good looking. 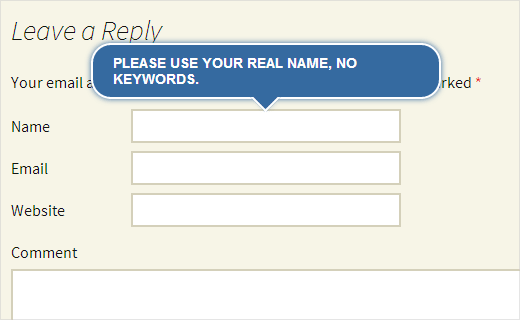 Recently, a user asked us how they can add jQuery tooltips to WordPress comment form. We thought others might find this useful as well. In this tutorial, we will show you how to add jQuery tooltips in WordPress comment form. Tooltips appear when a user takes their mouse to an item, usually providing them description about that particular item. In this tutorial, we will be adding jQuery tooltips to show tips like, Please use your real name in comment form fields. By adding jQuery tooltips, you can enhance user experience, and it will look nicer. $fields['email'] =  '<p class="comment-form-email"><label for="email">' . __( 'Email', 'twentythirteen' ) . '</label> ' . $fields['url'] = '<p class="comment-form-url"><label for="url">' . __( 'Website', 'twentythirteen' ) . '</label>' . '<input id="url" name="url" title="Your website or any social media profile URL" type="text" value="' . esc_attr( $commenter['comment_author_url'] ) . $fields['author'] = '<p class="comment-form-author">' . '<label for="author">' . __( 'Name', 'twentythirteen' ) . '</label> ' . '<input id="author" title="Please use your real name, no keywords." name="author" type="text" value="' . esc_attr( $commenter['comment_author'] ) . title="Please use your real name, no keywords." In this code, #commentform is the selector where jQuery will display tooltips and .tooltip is the content part where we have defined the position for tooltips. Feel free to modify this CSS file to meet your needs. That’s all. Now you have successfully created a plugin that adds jQuery tooltips in your WordPress comment form. All you need to do is upload wpb-comment-tooltips folder from your desktop to /wp-content/plugins/ directory on your web server using an FTP client like Filezilla. Once you have uploaded the plugin, go to Plugins page in WordPress admin area and activate the plugin. 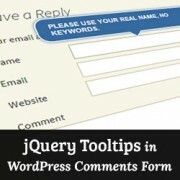 We hope this tutorial helped you learn how to add jQuery tooltips in the WordPress comment form. We encourage you to modify this code and try adding tooltips to other places. For example, check out how we added tooltip testimonials to our site. For feedback and questions, please leave a comment below. yeah its working…… nice tuts for beginner…. Everything is done according to the instructions but there is no output, why? This can be achieved very easily if the theme is built on Boostrap. This article would people who are not using themes built on bootstrap.